One of the more unusual items to be found in the British Library’s collection of James Gillray’s correspondence is a copy of a note which the printseller George Humphrey found lying on the pavement outside his shop on 19th April 1823. 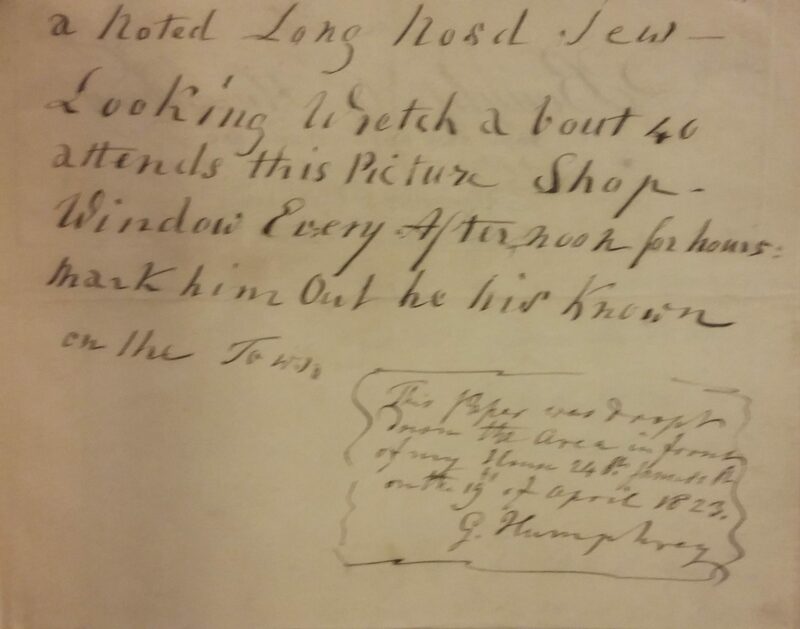 This paper was drop’t down the area in front of my house, 24 St James’s St, on the 19th of April 1823. G. Humphrey. Although the exact meaning and purpose of the note is as baffling to us as it evidently was to Humphrey, it seems likely that it was written by one of the printseller’s neighbours (or someone else who evidently had the opportunity to observe the comings and goings outside his shop for lengthy periods of the day), who was motivated not just by an obvious sense of antisemitism, but also by a concern that the printshop was acting as a magnet for some unspecified crime. In this respect at least, the author’s the fears may not have been completely without foundation. 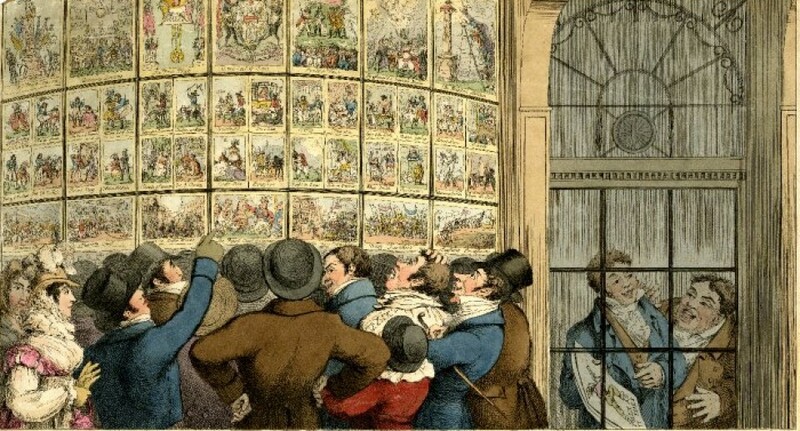 Whilst our view of Georgian printshop windows is a rather rosy one, unduly influenced by puff-piece caricatures of smiling crowds happily congregating to enjoy the latest prints, it is not one which would necessarily have been shared by contemporary observers who had experienced these crowds first hand. There are numerous records which indicate that the windows of even the most fashionable West End printshops served as the backdrop for a variety of crimes, ranging from petty thefts to homosexual soliciting, with the ‘low’ and potentially dangerous, nature of the crowds that gathered there proving to be a constant source of anxiety to conservatively-minded Londoners. Just as interesting as the note itself is the piece of paper it was written on. In his haste to transcribe the odd notice he’d found laying on the ground outside his shop, Humphrey had evidently grabbed the first piece of paper that came to hand, which in this case happened to be a blank customer bill marked with his letterhead. For me, this document goes some way towards answering a long-standing question about the nature of the Humphrey family’s publishing business, namely: “Given the small number of new prints the Humphreys’ published after Gillray’s final descent into madness in 1810, how did their business survive for so long?” George Humphrey’s letterhead quite clearly indicates that Gillray continued to act as the basis of the family’s business for years after his death. This over-reliance on simply churning out reissues of his works may have also proved to be the business’s undoing, stifling the sort of innovations in format and printing methods that were taking place elsewhere in the market during the 1820s and leaving Humphrey almost completely reliant on the public’s continued appetite for Gillray. Thus when tastes began to change from the 1820s onwards, Humphrey had nothing else to fall back on and found himself being rapidly overtaken by printsellers who had invested in new publishing techniques and the talents of new artists. This transfer-print plate on Queen Caroline‘s trial caught my eye recently. Although technically not graphic satire as such, the design was evidently influenced by the plethora of illustrated political pamphlets which were being published around the time this plate was manufactured. The use of a children’s nursery rhyme as a vehicle for subversive political satire for example, was clearly inspired by William Hone and George Cruikshank’s The Political House that Jack Built (1819), while the “Green Bags” were a recurring motif in caricatures on the trial. I’ll sing a song of sixpence / A Green Bag full of lies / four and twenty witnesses / All paid to be spies / When the Bag was opened / The Lords began to stare / To see their previous evidence / All vanish’d into air! This is surrounded by a floral border intertwined with a scroll carrying the legends ‘Long Live Caroline’ and ‘Queen of England’ as well as the names of the members of the Queen’s counsel. 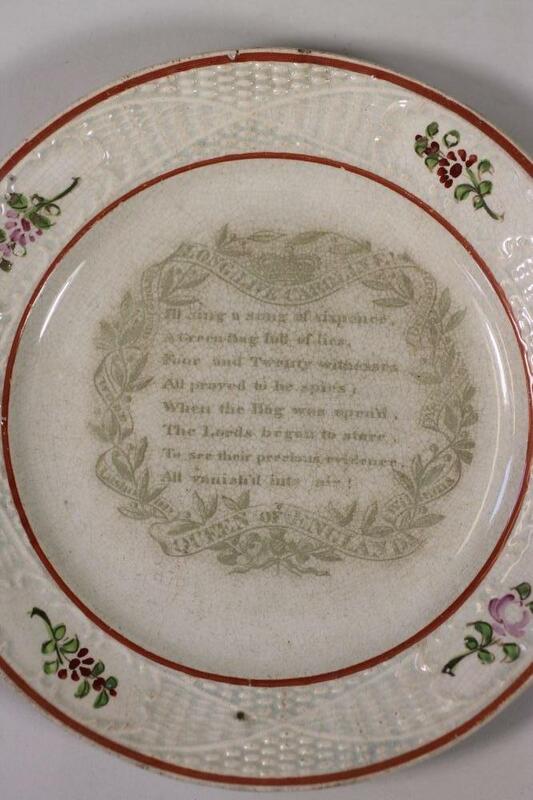 I would guess this piece was produced as a commemorative item shortly after the government announced the withdrawal of the Bill of Pains and Penalties, intended to dissolve the royal marriage and strip Caroline of her title, in November 1820. Isaac Cruikshank was one of a number of noted late eighteenth-century caricaturists to supplement their income from engraving with sales of drawings and watercolours. However unlike his more celebrated contemporaries such as Thomas Rowlandson and James Gillray, who attempted to pursue careers in the comparatively elevated artistic fields of landscape and portraiture respectively, Cruikshank’s original works remained rooted in the comic humour of his caricatures. The only real difference between his output as a watercolourist and that as an engraver seems to have been his complete abandonment of political satire, with his paintings dealing solely with the humour derived from scenes of sociability, domestic life and the bawdier elements of romance. His original watercolours seem to have been produced for a number of different reasons. Some were proofs for caricatures, songsheets and broadsides, which would be engraved by Cruikshank or someone else and published. Others appear to have been standalone pieces in their own right which were probably sold to collectors, with the printsellers Laurie & Whittle apparently enjoying a particularly favoured position as suppliers of Cruikshank originals during the 1790s. This pencil sketch by Isaac Cruikshank is coming up for auction in the US in a few days time. It sadly appears to be rather faded but the principle characters are clearly discernible. The scene is set immediately outside a country inn, where a rustic on horseback is being offered a mug of ale by a buxom and slightly over-exposed young barmaid. The man is clearly delighted by the view he’s enjoying from on top of his horse and scratches his head and grins inanely. The drawing is signed ‘IC’ in the lower right-hand corner and further evidence of Cruikshank’s hand can be found by comparing the figure of the rustic to that which appears in The Way to Stretchit, a late caricature by Cruikshank which was published by Thomas Tegg in May 1811. The faces of the two figures are almost identical and have the same long fringe and broad-brimmed hat. 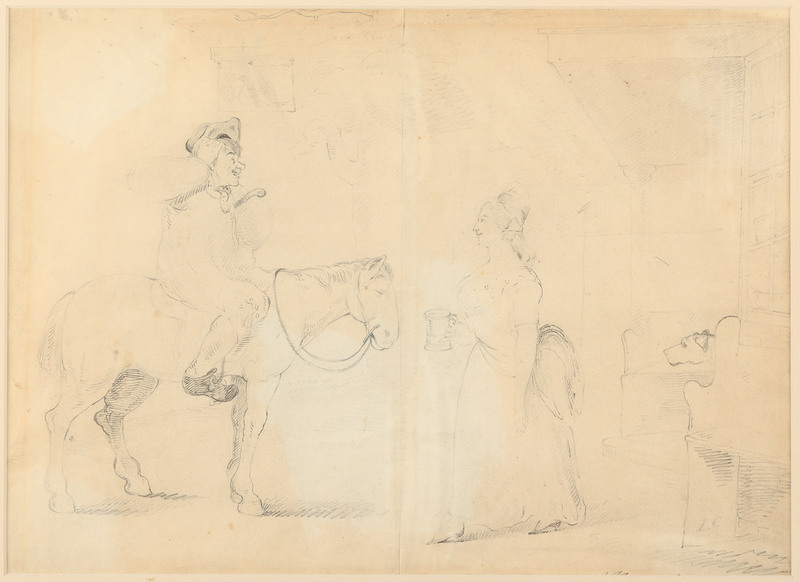 This indicates at the possibility of the drawing being a rare late composition by Cruikshank, which may indicate why it was never finished (Cruikshank died in April 1811). 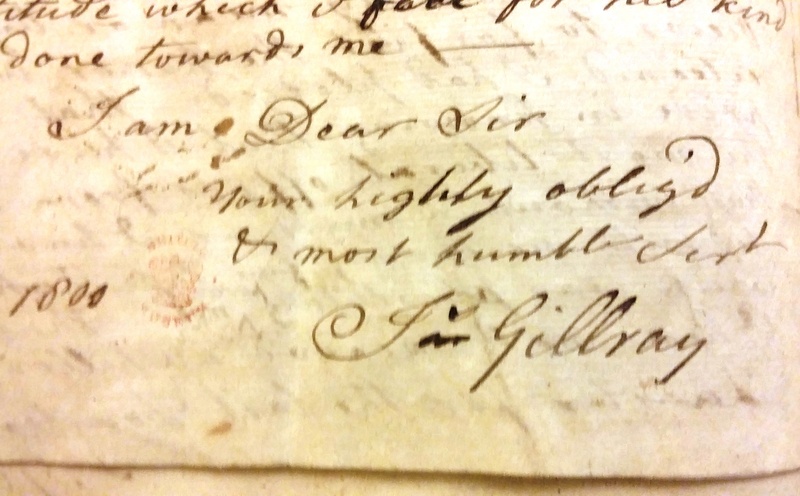 James Gillray’s signature on a letter dated 1800. BL Add Mss 27337. By the middle of the 1790s James Gillray was becoming something of a celebrity among the affectedly art-conscious ranks of the British upper classes. The surviving remnants of his personal papers indicate that his postbag bulged with letters from amateur caricaturists and aspiring wits who desperately sought to have him translate their ideas into print. The following letter, written by Francis Hawksworth Esq. of Hickleton Hall in South Yorkshire, is indicative of the type of correspondence Gillray must have received from such people on a fairly regular basis. In this case Hawksworth goes a step further in actually requesting that Gillray touch up a plate he had already partially engraved himself and then send him copies of the finished prints. Gillray’s reply hasn’t survived but it seems hard to imagine that he would have turned down the request, particularly as Hawksworth he had offered to pay him a fee equivalent to that he would normally expect for engraving a new plate of his own design from scratch. Enclosed I send you five Guineas, which will cover your acc[oun]t for etching Sir George Sackville’s Monument. I have begun to try etching myself, but I am so defeated in the attempt that I must apply to you for a little assistance. Will you send me down a couple of needles and some wax, the same that you etch with yourself, and tell me how you lay it on… I have a great favour to ask of you. I have sent up by the mail coach of tonight a copper plate that has a very bad etching on it – some parts about the buggy are too strong, some parts by the horse are so weak as not to be seen in the impression. I would have destroy’d the plate immediately had not the face and figure of the man been so extraordinarily like him that I am sure I can never get such a resemblance again. Now I want you to cover the plate with wax… and touch it up for me. I would be very happy to give you the same price for doing this as if you were to etch a new one. If the lines of the face are too strong, you must burnish them down, but not by any means alter the likeness. Pray get the plate cut off at the bottom just above the letters and make a couple of lines at the sides of the plate. I know I have imposed upon your hands a piece of drudgery, but I really shall by greatly obliged if you will make an attempt to make it look decent. The sooner you send it me down and the better with twelve impressions not coloured [sic]. Give my complements to Mrs Humphreys [sic]. Your obed. servt. F. Hawksworth. Hickleton Hall near Doncaster. P.S. I admire very much your etchings of Lord Moira, Mr Skeffington and Penn, they are vastly good indeed. Add Mss 27337 ff 53. Bold text represents underlining in the original. Another snapshot from James Gillray’s personal papers. 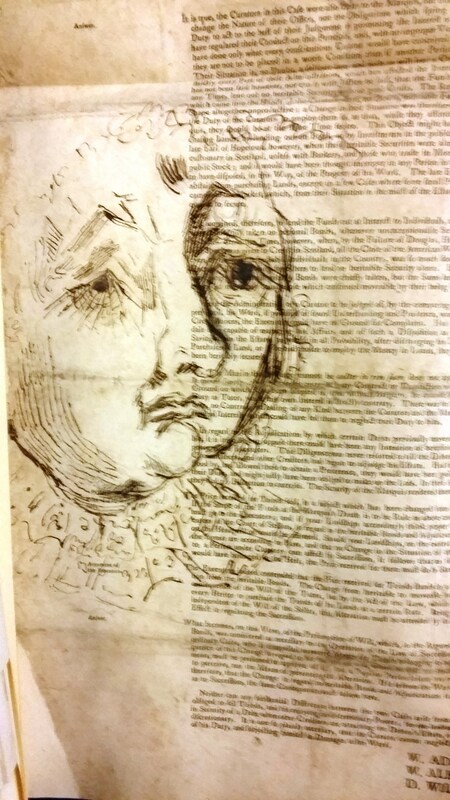 This portrait of rather sad looking old lady, dressed in a lace bonnet and collar, was hastily sketched onto a page torn from a legal transcript. Her identity is a complete mystery – was it someone Gillray knew, even his elderly mother perhaps? Or, given the choice of paper and the fact that we know Gillray was occasionally dispatched to the courts to obtain portraits of notable criminals, perhaps it was just a face in the courtroom that briefly captured his attention? We’ll never know of course, but I think it’s quite nice to think that an otherwise fleeting moment in this woman’s existence has been inadvertently captured for posterity in this way.